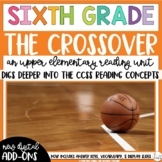 The Crossover, by Kwame Alexander, Complete Literature UNIT ~ 95 pgs! Anticipation Guide with TDA question and organizer to activate background knowledge before reading The Crossover. 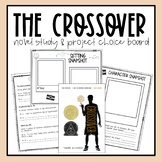 This is an Anticipation Guide for the book, The Crossover, by Kwame Alexander. This is a perfect activity to help preview an upcoming book with students and get them talking about upcoming themes/topics. 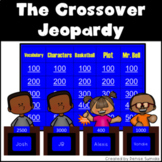 40 questions for use in Battle of the Books based on the book "The Crossover" by Kwame Alexander. 20 "In the book..." and 20 "In which book..." questions, formatted for quick, easy copying and cutting! Save yourself some time! 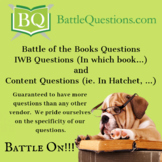 100 questions to use for battle practice, games, review, tests or other activities. Written in Battle of the Books format. Questions scan the entire book from start to finish. Page numbers included for each question. The lessons on demand series is designed to provide ready to use resources for novel study. In this book you will find key vocabulary, student organizer pages, and assessments. This guide is divided into two sections. Section one is the teacher section which consists of vocabulary and activities. This is a handout with a rubric built in to assess character analysis. It includes the following Common Core Standards. RL.8.1. L.8.2., and IA.1. 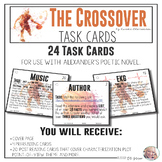 It was specifically written for the book Crossover by Kwame Alexander, but it can be easily adapted for other books.